Union leaders are scheduled to meet at 11 a.m. on Friday to discuss the tentative pact. The UAW and Fiat Chrysler reached another tentative agreement on a new labor contract early this morning, averting a threatened strike that could have sent some or all of FCA’s 40,000 unionized workers off the job. The union, in a statement, said its bargaining committee "secured significant gains" in the new agreement. Details weren’t disclosed. “We heard from our members, and went back to FCA to strengthen their contract,” UAW President Dennis Williams said in the statement. The tentative pact came after the UAW gave FCA notice Tuesday that it would no longer work under the extended terms of its former 2011 contract. The union and FCA had reached a tentative agreement Sept. 15 on a new labor contract, but its terms were rejected by UAW members at FCA 65 percent to 35 percent. "FCA US confirms that it has reached a new tentative agreement with the UAW. Because the agreement is subject to UAW member ratification, the company cannot discuss the specifics of the agreement pending a vote by UAW members," the statement said. The UAW said the bargaining committee unanimously agreed to send the tentative agreement to local union leaders. As it did last month, the union will schedule informational meetings with local leaders to go over terms of the proposed contract before another membership ratification vote in the coming days. That meeting is set for 11 a.m. on Friday, the UAW said in its announcement. 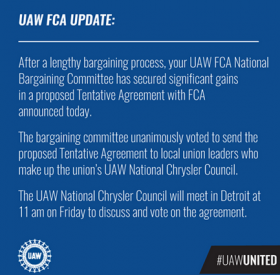 The UAW selected FCA US as its initial target for pattern bargaining with the Detroit 3. The union’s 2011 contracts with Ford Motor Co. and General Motors were extended as talks proceeded with FCA. Had a deal not been reached and a strike called, it would have been the first time the UAW has struck a Detroit 3 automaker over wages and benefits during national negotiations since brief walkouts, first at General Motors, then at Chrysler, in the fall of 2007. Under Chrysler and GM’s U.S. government bailouts in 2009, the union was prohibited from striking the two companies during the 2011 round of labor talks. In rejecting the Sept. 15 tentative agreement with FCA, UAW members said on social media that the main issues were continuation of the controversial two-tier wage system, displeasure over alternative work schedules and job security matters. It was unclear what changes were made by bargainers to achieve a new agreement. FCA is in the worst financial shape of the three Detroit automakers and least able to afford significant increases in labor costs or an extended strike. FCA would lose roughly $1 billion in revenue and an estimated $40 million in operating profit per week in a general strike, according to auto analysts quoted by Reuters. UAW members would have been asked to make tremendous financial sacrifices as well during an extended strike. Strike pay is $40 per day, or $200 per week, but doesn’t start until the eighth day of a strike. The rejected tentative agreement would have provided raises to both higher-paid legacy workers and lower-paid Tier 2 workers. Legacy workers, who comprise 55 percent of FCA’s hourly workforce would have seen their wages rise from $28 an hour to $30 an hour. Tier 2 workers would have progressed from $16 to $19 an hour to $17 to $25 an hour.